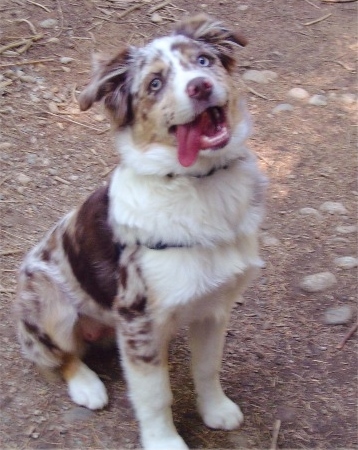 RunAmok Farm - Producing lovely pups which embody the essence of the Australian Shepherd. Consistency is one of the most important goals and the reason our puppies are so sought after! Here are some of our sweet babes who have been produced here over the years... We think you will enjoy the visit! Sadie! I can't thank you enough for my Sadie! If I had given you a list, you could not have picked a better match for our family! I especially want to thank you for what a pleasure it was working with you to get a puppy. From the first time I contacted you it was obvious that you REALLY love your dogs and spend a great deal of effort keeping up to date and knowing what is best for them. None of the other breeders I contacted seemed to have their hearts in it like you do. You have a wealth of knowledge about picking a puppy, temperament, vaccinations, nutrition, training and probably much more that we hadn't gotten around to talking about. You may have noticed that when we discussed various issues relating to dogs and you would tell me the differing points of view, I would ask you what you thought. I've owned dogs almost my whole life and I greatly trust and respect your understanding of dogs. Thank you for the good advice you've given me... but mostly, thank you for Sadie! Just wanted to let you know that Phil, Olivia, and Mr. Furious (now Scout) made it home! Oh my gosh! He's sooooooo cute! Much tinier than I expected! He is just a doll! We got a lot of compliments and he loved seeing all the new different parks and meeting other dogs. He's very friendly with everyone and loves to play, but everyone notices how calm he is. Frankie absolutely loves him-almost too much at times but I think they are getting used to each other...I don't know why I'm telling you all this, you know him better than I do! You can tell I'm a proud mom already. I swear, I think he's just the smartest best dog ever! Just a perfect fit. It was great meeting you and your husband and I'm so glad it worked out, Bounder is such a good little dog. I would recommend you to anybody! It was a great experience and I was so leery considering the last one I had. I'll make sure to send pictures when I get them! You can absolutely use me as a reference and let me know if someone wants to call me in advance and I would be more than happy to talk with them. Bounder is getting his shots this weekend and he's scheduled next week for puppy obedience classes. I think they are going to teach me to teach him more than anything else. Of course he will be the smartest one there. I will see if I can get some pics to you but probably not till around Christmas. It was so hot here this summer that we had Faith clipped to keep her cooler. So, right now the only curls are on her ears! She's actually cute clipped but we'll let her grow back till next summer. She's 19 1/2 months old and doing great. Very well behaved except for jumping up on people (we're still working on it). She's a seasoned traveler - to the ocean, camping, visiting her "brothers" homes. Loves to chase balls and brings them back! Very busy girl too. Thank you again for such a sweet dog. Anne is doing awesome. She is so adorable. The boys really love her and she loves them. At night she literally tears up the house. Then she will run to us, sit at our feet and look up with her big eyes and long tongue hanging out of her mouth! One of these nights I've got to get a picture of it :) She is hilarious! They are keeping me busy! I want to send you some pics but I'm computer illiterate, so I'll have to get Jeanice to help. Hope all is well with you and yers. I just wanted to send you a note and let you know that I'm doing exceptionally well and having lots of fun in Virginia. I'm eating and drinking well and doing all my business. It's been really hot here so I've been doing most of my romping inside where it's cool. My new dad has been trying to communicate with me. He says things like "good sit", "good come" and asks me if I have to go "out" (he asks me that a lot). I think I'm beginning to understand what he means. I get tasty treats when I do those things. Sometimes I get treats and I don't even know what I've done right. Dad looks tired but he smiles and laughs a lot. He tells me that I'm just the sweetest, purdiest little puppy in the whole wide world! Dad says to say hello and that he'll try to download and send you some photos later today when I'm "recharging my little batteries." I fed her a chicken leg and was amazed at the way she scarfed it down, very impressive! I also gave her a half tab of the puppy sups, which she also made disappear in an instant, then one of your liver treats for desert. She lapped up a bunch of water out of her bowl, so even though it was dark I brought her down to the grass in the back yard, she had a good pee with tons of puppy praise on my part, so I was feeling pretty smart and figured there'd be no "accidents" in my house... ya, right! In the backyard she had a blast as she ran all over, zooming in at me from all angles, those herding instincts run deep. Inside the house I just followed her around and rolled up the nice Persian area rug she enjoyed to chew, the coarse woven Ikea rug had to be removed too... shoes, a couple of plants, some electrical cords, I knew this was going to happen, I just wanted to see it for myself. Bed time, I'm pretty wiped and I'm setting up Carleigh's first night away, she'll be on the floor next to my bed, I brought the kennel in and rigged it so the door wouldn't close and blocked in an area between my side of the bed, the wall, the chest of draws and the kennel. I knew she's he a bit whiny but I figured she'd settle down and sleep... She did whine about every hour or so but I got about 4 hrs. of sleep, and I figure that that is pretty good for the first night. She did use her kennel to pee in, so that was nice for me. 6:30am take Carleigh out to the backyard, 7:00am the other leg and thigh of the chicken, puppy supps, and a liver treat, lots of water this time from the pond... Carleigh's not into the stainless steel water bowl I bought her, the pond is much more natural (I take that as a compliment). 12:00noon I teach a UFC style Jiujitsu class, 2 people for this one. Because all of the training involves wrestling and ground techniques Carleigh just can't believe it... she's in for the fun! For Carleigh, if you're on the floor you're free game for a lick and a chew. The guys and Carleigh had a great workout. shiver. I give her a good rub down, then wrap her in a nice thick blanket and take the oppertunity to grab a few ZZZs. I tuck Carleigh up in the blanket, hold her close to help warm her, and lay down on the couch, her shaking fades away as we both nod off. 20 minutes later we're both "good to go". 6:00pm dinner chicken breast, but she doesn't eat too much of it. I put the remainder in the fridge and out to the backyard we go. Carleigh goes [and] I'm giving her huge puppy praise! She's snoozing right now, but at 8:00pm I'll take her out again for a little run around the yard. We had a long day. Zefryn only barked a couple of time, and then spent the rest of the trip either resting or standing on his hind legs and watching the scenery go by. We had stopped at Wal-Marts to get his collar, leash and a dish for food and water. While we were there, we couldn't resist getting a few toys for him and Feenix. Once we arrived home, we went straight to the Alumni Soccer game that is held every year in Justin's honor (he was our oldest son, who was killed in a car wreck ten years ago). He was surrounded by so many people who ohhed and awed at him. And he basked in the attention! 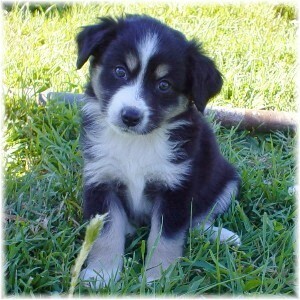 There are now alot of people in our area who are interested in Aussies as a result of meeting him. He really warmed up to all the attention. He romped around and pranced and even licked faces. We were just talking today about how it'd be nice to give you a little update on Roux. First of all, we are in love. She's a real sweetie pie and definitely has a little sass too. She's walking perfectly on her leash and loving time in the forest romping around trails. We've been so lucky to get Roux while Seth was off school, so she has had one of us by her side all this time. Sadly, Seth is headed back to school next week, so we won't have that luxury much longer. She will have one of us with her most of the time though and will be with my mom and her border collie the rest of the time. Has the 2nd litter of puppies for the summer arrived? Bet they're beautiful. I've attached a couple pictures of Roux. We'll keep sending them along. Hope you are well and have a lovely weekend. Junie really is the sweetest puppy! I have to go to work tomorrow, sigh. I will be envious of Seth who will be home with her all day. Luckily, I work in the same neighborhood as where we live so I can come home for lunch and play with the cutie pie. Hope you're well, and thank you so much for raising such a wonderful girl.